Installation of GDS ArcSystem 8 Cell luminaires to provide fully dimmable. high brightness lighting for use in classical concerts. 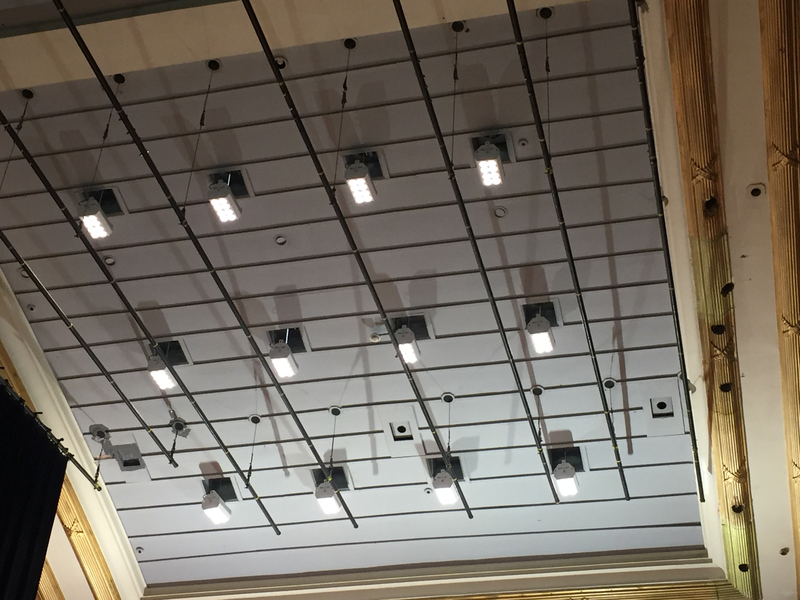 With the continued reduction in the availability of high wattage halogen lamps, the De Montfort Hall were looking for an alternative solution to replace their ageing 1kW source orchestra lighting. GDS ArcSystem 8 Cell luminaires were chosen by the technical staff at De Montfort due to the ability to ‘dim to zero’ and the energy saving of 85% per fitting. Push The Button were selected to supply and install 73 white 8 Cells, manufacturing and installing custom brackets to hang them in the existing ceiling locations. The new luminaires are wirelessly controlled utilising the GDS ArcMesh wireless control system integrated into the venues existing ETC Unison system.